If you grew playing games up in the early ‘90s playing games in arcades or at home, odds are you tried out some great beat’em up games. Whether it was street brawlers like Final Fight and Streets of Rage, or fantasy-themed ones liked Golden Axe and King of Dragons, I just couldn’t get my fill of the genre. Like many things in life, games tend to be cyclical and different types burn bright and die out and then many years later they come back with a vengeance. 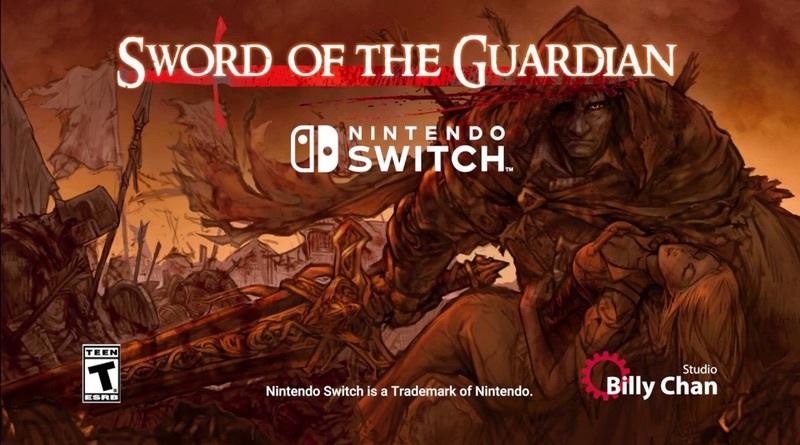 Thankfully the indie scene has done a bang-up job resuscitating the brawler market and the latest is from solo developer Billy Chan who has created Sword of the Guardian. The problem is, it’s just not that special. This game is obviously modeled and heavily influenced by the classic Sega franchise Golden Axe. At the start you can choose from a dwarf, a swordsman, and a monk – all of whom have different attributes, special attacks, and base weapons. The objective is simple. You’ll encounter a group of enemies, and once you defeat them you’ll progress through the 2D stage. Waiting for you at the end is – you guessed it – a boss, which is usually a large brute with difficult to avoid attacks and an extensive health bar. If you successfully win the battle you’ll advance to the next stage. There are over 10 stages and most take about 15 minutes to complete, so this is a longer game than most others like it. The controls are basic. You have your main attack with your primary weapon – the monk uses hand-to-hand combat, the swordsman wields a broadsword, and the dwarf rocks a battle-axe. You can also perform simple combos as well as run and jump strikes. When you are in a tight spot, you may choose to activate your special move, which will harm all of the enemies in the vicinity, however this has an energy bar so you’ll want to conserve it until you absolutely need it. There are many projectile weapons you can pick up and throw such as bombs, axes, daggers, and Molotov cocktails. You can also acquire magical attacks, such as hurling a mystical whirlwind at a group of monsters. These items are either dropped by enemies or found in barrels that you must destroy. You begin with 3 lives and you have a health meter, which depletes when taking damage. There are no voices in the game, and the story is all told through text – which thankfully can be easily skipped. You are guardians who feel compelled to protect the innocent townspeople against corrupt and evil men as well as monsters. I had little interest in the story and dialogue, which like the rest of the game is fairly average. Games like this are all about the action, so I don’t fault it for not having an incredible plot. The soundtrack is one of the highlights of the game. There are some really great tracks that go terrific with the medieval theme, and there is a new tune on every stage with each of them matching the setting. The levels themselves are designed well and feature some cool weather effects and a variety of landscapes and settings. The atmosphere is dark and dreary, as opposed to Capcom brawlers, which are usually bright and colorful. However, the enemy and character designs really fall flat and mar the game. The enemies look like they borrowed the art style of the first Mortal Kombat and they don’t hold up. They are ugly, nameless, and unmemorable, which is unfortunate when you consider that classics like Final Fight and Streets of Rage feature characters and bosses that I can still name. This isn’t a terrible game, and of course I have a lot of admiration for the one-man development team. However there’s little that Sword of the Guardian does that makes it stand out against the heavy competition. The combat is serviceable, but is repetitious, lacks originality, and often feels stiff. There’s nothing exciting about the story and characters. The game’s biggest strength is the option to play 2 or 3 player co-op. Even then, there are many other games in this genre that are superior. When stacked up against the similar classic Golden Axe games or Knights on the Round, I’d still choose to play the older titles. Sword of the Guardian also has the misfortune of releasing at the same time as the Capcom Beat’em Up Bundle, which features 7 of these classic games at only $19.99, a far better value. Still, if you’re looking for a stupid fun time with some friends and have exhausted all other options, this one could do the trick. Beat’em up games have been around over 30 years. I’m sorry to say, but Sword of the Guardian doesn’t improve upon this classic style or bring anything new or exciting to the table. I’d only recommend if this goes on sale or you’ve exhausted all other brawler games and want something new.